Official history of the museum. 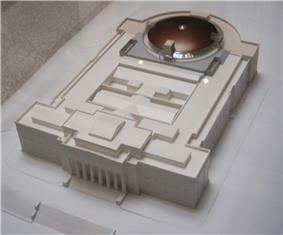 Model of the museum, the new copper dome at the rear. Part of the entablature on the museum's facade, depicting war scenes on its frieze. The museum seen from Maungawhau / Mount Eden, showing the wavy shape of the copper dome. The Auckland Museum traces its lineage back to 1852 when it was established in a farm workers' cottage where The University of Auckland is now located. With an initial call for the donation of specimens of wool for display it attracted 708 visitors in its first year. Interest in the museum dwindled over the following decade even as its collection grew, and in 1869 the somewhat neglected and forlorn museum was transferred to the care of The Auckland Institute, a learned society formed two years earlier. An Italianate-style building was constructed for the museum in Princes Street, near Government House and across the road from the Northern Club. These new premises included a large gallery top-lit by a metal framed skylight. This room proved problematic as it was impossible to heat during the winter but overheated during the summer. Canvas awnings used to shield the roof from harsh sunlight made the exhibits difficult to view in the resulting gloom. One of the visitors during the 1890s was the French artist Gauguin, who sketched several Maori items and later incorporated them into his Tahitian period paintings. In the early years of the 20th century the museum and its collections flourished under visionary curator Thomas Cheeseman, who tried to establish a sense of order and separated the natural history, classical sculpture and anthropological collections which had previously been displayed in a rather unsystematic way. The need for better display conditions and extra space necessitated a move from the Princes St site and eventually the project for a purpose-built museum merged with that of the war memorial to commemorate soldiers lost in World War I. 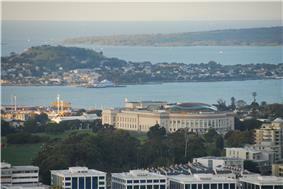 The site was a hill in the Government Domain commanding an impressive view of the Waitamata Harbour. Permission was granted by the Auckland City Council in 1918, the Council in its liberality being given three seats on the Museum Council. As well as an initial gift of £10,000 the Council also agreed to an annual subsidy from the rates towards maintenance of the facility and eventually coaxed several of the other local bodies to the principle of an annual statutory levy of £6,000 to support the museum's upkeep. The world-wide architectural competition was funded by the Institute of British Architects, a £1,000 sterling prize drew over 70 entries, with Auckland firm Grierson, Aimer and Draffin winning the competition with their neo-classical building reminiscent of Greco-Roman temples. In 1920 the present Domain site was settled on as a home for the museum and in the 1920s after successful fund-raising led by Auckland Mayor Sir James Gunson, building of the Auckland War Memorial Museum began, with construction completed in 1929. It was opened by the Governor-General General Sir Charles Fergusson. The building is considered one of the finest Greco-Roman buildings in the Southern Hemisphere. It has an 'A' classification from the New Zealand Historic Places Trust, designating it as a building whose preservation is of the utmost importance. Of particular interest is the interior plasterwork which incorporates Maori details in an amalgamation of Neo-Greek and art-deco styles. Likewise the exterior bas-reliefs depicting 20th-century armed forces and personnel are in a style which mixes Neo-Greek with Art-Deco. The bulk of the building is English Portland Stone with detailing in New Zealand granite from the Coromandel. Two additions were made to the 1929 building, the first in the late 1950s to commemorate the Second World War when an administration annexe with a large semi-circular courtyard was added to the southern rear. This extension is of concrete block construction rendered in cement stucco to harmonise with the Portland Stone of the earlier building. In 2006 the inner courtyard was enclosed by the grand atrium at the southern entrance. The quotation 'The Whole Earth is the Sepulchre of Famous Men' over the front porch is attributed to the Greek general, Pericles, in keeping with its commemorative status to affairs of a martial nature. In the last two decades, the museum was renovated and extended in two stages. The first stage saw the existing building restored and the exhibits partly replaced during the 1990s for $NZ 43 million. The second stage of this restoration has seen a great dome – atrium constructed within the central courtyard, increasing the building's floor area by 60% (an addition of 9,600 m²) for a price of $NZ 64.5 million. $NZ 27 million of that was provided by the government, with the ASB Trust ($NZ 12.9 million) and other donors making up the remainder. The second stage finished in 2007. The copper and glass dome, as well as the viewing platform–event centre underneath it, had been criticised by some as 'resembling a collapsed soufflé', but quickly won the admiration of critics and public, being noted for 'its undulating lines, which echo the volcanic landscape and hills around Auckland'. Standing in the event centre underneath the top of the dome was likened to being underneath the 'cream-coloured belly of a giant stingray', 'with its rippling wings hovering over the distinctive city skyline'. In June 2007, the 'Grand Atrium' project also received the Supreme Award of the New Zealand Property Council, which noted it as being "world-class", and a successful exercise in combining complex design and heritage demands. It has also received the ACENZ Innovate NZ Gold Award (Structural Engineering) for the redevelopment. The new sections underneath the dome, mostly contained within a kauri-wood-panelled sphere approximately 30 m across, will add 900 m² of additional exhibition space, as well as a 700 people event centre under the dome roof with a 48 m wide free span, new areas for tour and school groups including an auditorium in the sphere-bowl with 200 seats, as well as a restaurant with 450 seats. The bowl, which is the internal centre-piece of the expansion, weighs 700 tonnes and is suspended free-hanging from trusses spanning over it from the elevator four shafts located around it. A new 204-space underground parking garage at the rear has also been constructed to help cover the high demand for parking in the Auckland Domain. The new sections of the museum have been favourably likened to a Matryoshka doll, buildings nested within a building. There have been preliminary talks of building a new railway station (possibly featuring the historic station building of the Newmarket Train Station) in the Parnell suburb directly to the east of the Museum. It is thought that such a station would see high demand from museum visitors, especially students and school children. The museum houses a large collection of Māori and Pacific Island artefacts and treasures, including for example three entire buildings, including Hotunui, a large carved meeting house built in 1878 at Thames, and Te Toki a Tapiri, a waka taua (war canoe) from 1830. The museum also stores a photographic collection of 1.2 million images, and stores and exhibits 1.5 million natural history specimens from the fields of botany, entomology, geology, land vertebrates and marine biology. The stated goal is to eventually possess specimens from all New Zealand species. There is also an extensive permanent exhibition covering wars, both within New Zealand and New Zealand's participation in overseas conflicts. This exhibition is linked to the War Memorial (see below), and for example shows models of Maori pas (earth fortifications) and original Spitfire and Mitsubishi Zero aeroplanes. The Museum holds the largest collection of applied and decorative arts in New Zealand and selections are currently displayed in the Landmarks and Encounters Galleries. The museum also offers changing special exhibitions. In the recent past (2006), these have included a Da Vinci and a Vikings exhibition. The initial exhibition after the grand re-opening in early December 2006 was 'Vaka Moana', a show about the first Polynesian explorers reaching New Zealand. Afterward, the exhibition started travelling the world for several years. Currently (early 2009), the museum is host to a cast of the most complete (over 90%) Tyrannosaurus rex fossil ever found, nicknamed "Sue". RSA representatives have noted that the Cenotaph area is in need of renovation, and also would like measures put in place that ensure the area is treated with more respect by people using the park or visiting the museum. Auckland City was considering replacement the old concrete paving with granite and basalt pavers. This was apparently decided against, possibly for cost reasons. The city has however conducted substantial remedial works, to improve the condition of the existing Court of Honour, including repairs to and lighting of the steps, uplighting of the Cenotaph, as well as general cleaning and a new interpretive engraving provided by the Auckland RSA. In early 2010, Auckland City Council started work in front of the Court of Honour, up to then taken up by a smaller car park. The area is to be changed to provide a new water feature instead, and walkways and other infrastructure will also be upgraded. Work around the court is to be completed by Anzac Day 2010, with the remainder following in July 2010. The memorabilia of the late Sir Edmund Hillary, first man to reach the summit of Mt. Everest, led to legal action between his children, Peter and Sarah Hillary, and the Museum over whether the Museum had the right to exhibit and provide to researchers online the donated material as rightful owners of the collection. New Zealand Prime Minister John Key offered to mediate, and his offer was accepted. The matter was resolved amicably. On Monday 20 July, the Board of Auckland Museum and Peter and Sarah Hillary released a joint statement saying: "Both parties are pleased that Sir Edmund’s final wishes have been satisfied by the placement of the Archive in the Museum. The Hillarys recognise the expertise and reputation of the Museum as a world class repository and that it is important that an Archive of such public importance has been entrusted to the Museum." In the agreement the museum acknowledged the material it held included personal family history and that Sir Edmund's children had special rights over the use of the estate. The Hillary family also acknowledged that the museum had the right of possession and would conduct an inventory of the archive. The inventory would record documents that Sir Edmund clearly did not intend the Museum to have and these would be returned. It would also identify any documents that should be restricted for 20 years unless the Hillary family permitted their use. The appointment and activities of Dr Vanda Vitali, a Canadian citizen appointed new museum director in the late 2000s (until her resignation in 2010) saw a number of highly disputed changes in the museum, with numerous staff being made redundant, or having to reapply for their positions. The museum also charged a controversial "donation" for entry (while still claiming to provide free entry), despite a museum levy being part of the regional rates. Vitali was roundly criticised for many of her actions by a number of former staff and public figures, such as editorialist Pat Booth who accused her of downplaying the "War Memorial" element of the museum name and function, as well as by former finance head of the museum, Jon Cowan, who in a letter to the New Zealand Herald argued after her resignation that she was responsible for a significant fall in visitor numbers and visitor satisfaction during her tenure. He also claimed that these statistics had ceased to be published in the second year of Vitali's work at the museum, given the clear negative trends of her initial year. ^ Note that this shortened form is controversial, as the museum has been accused of downplaying its war memorial role when it used the shortened form.